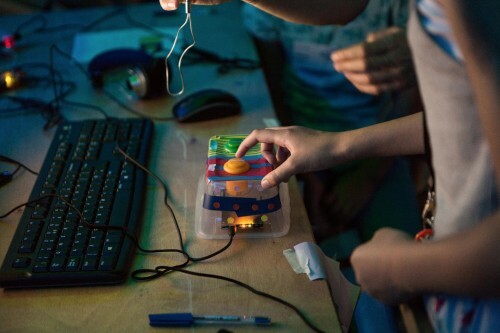 The Sonic Pi: Live & Coding summer school finished just over three weeks ago, and yet our heads are still full of it! 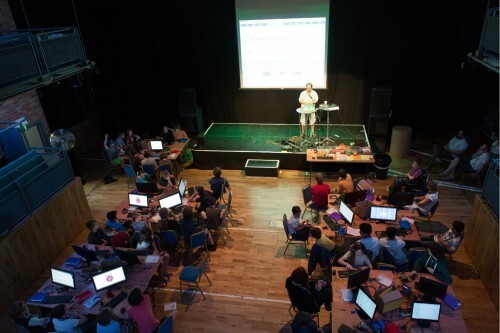 It was a brilliant week where 56 children aged between 10 and 14 years spent the week at the Cambridge Junction, working amazingly hard not only to get to grips with the language of live coding, but also learning how to finesse that language and perform with it using Sonic Pi on Raspberry Pi. It was a beautiful thing to be a part of. Over the course of five days the students went from having never used Sonic Pi before to putting on a concert for an invited audience, incorporating never-before-seen software functions (literally added on the spot by Sam Aaron – the brains behind Sonic Pi – to help realise the students’ ambitions) and incredible showmanship! The plan for the week was not only to introduce the students to the technical aspects of Sonic Pi (i.e. how do you make a sound, and then make it sound how you want it to sound etc) but to offer an overview of what live coding sounds like and looks like and what it might become in the students’ hands. To this end we were lucky enough to see performances by Thor Magnusson, Shelly Knotts and Sam Aaron himself (wearing an incredible cyberpunk/wizard get-up – it’s amazing what a party hat and a pair of novelty sunglasses can do). The students were able to quiz the performers, who were all very open about their practice, and to get a sense not only of how these performers do what they do on-stage but also of why they do what they do. The summer school was delivered by a great team that we were proud to be part of: Ben Smith, Ross Wilson (both professional musicians) and Jane Stott (head of music at Freman College) had all been part of the initial schools project during the summer term (at Freman College and Coleridge Community College) and brought their experience from those projects to help the students at the summer school on their journey into live coding. Michelle Brace, Laura Norman and Mike Smith did an amazing job of keeping everything moving smoothly over the course of the week, and in addition Michelle did a brilliant job of keeping everybody on track with the Bronze Arts Award that the students were working towards as part of the week, as well as project managing the whole thing! Pam Burnard and Franzi Florack were working on the research component of the project, interviewing students, observing the process of the week and feeding back to us – their feedback was invaluable in terms of keeping the week moving forward in a meaningful way. We had visits from Carrie Anne Philbin and Eben Upton from Raspberry Pi who supported the project throughout. 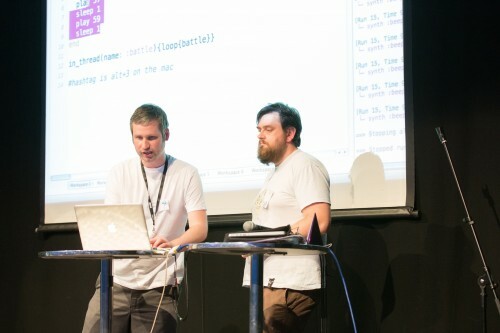 Finally Sam Aaron was resident Sonic Pi guru, handling all those questions that no-one else could answer and being a general all-round ball of live coding enthusiasm. The week held many highlights: the first ever Sonic Pi live coding battle (featuring 56 combatants! ); live ambient soundtracks produced by thirty students playing together, conducted by Ross Wilson; Sonic Pi X Factor; and great guest performances by Thor and Shelly. From our perspective though there was no topping the final event. The students worked in self-selected groups to produce a final project. For many this was a live coding performance but the projects also included bespoke controllers designed to aid the learning process of getting to grips with Sonic Pi; ambient soundtrack installations; and a robotic performer (called ‘Pitron’). The performances themselves were really varied in terms of the sounds and techniques used, but were universally entertaining and demonstrated the amount of information and knowledge the students had absorbed during the week. 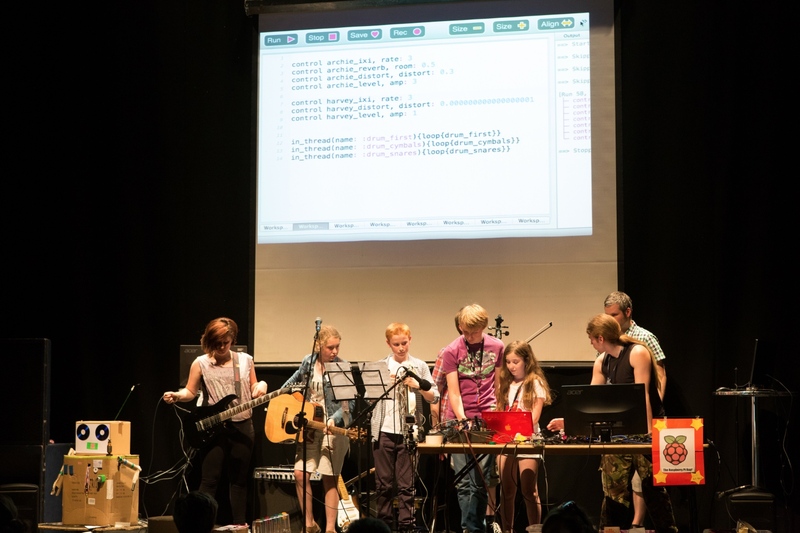 One group used live instruments fed directly into Sonic Pi, using a new function that Sam coded during the summer school – a Sonic Pi exclusive! A personal highlight were the Sonic Pi-oneers, a seven piece live coding group who blew the crowd away with the breadth of their live coding skills. They’re already being tipped as the One Direction of the live coding world. Another great moment was Pitron’s appearance on stage: Pitron’s creator, Ben, delivered an incredible routine, using lots of live coding skills in combination with genius comedy timing. Live coding of music with Sonic Pi, instruments and installations. All in all the summer school was a phenomenal thing to be a part of. We have never quite experienced anything like it before – it truly felt like the start of something new! Sounds like an amazing event. Will there be one again next year, do you think? I’m not certain, but I’d be surprised if it did not happen in a similar way again. Any recording? I’ve love to hear the performances. 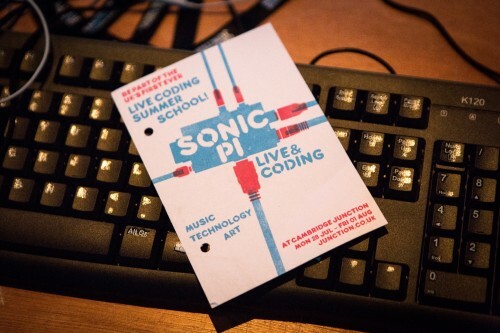 Wow this sounds fantastic…but then Sonic-Pi is a fantastic program and there is always more to do with it using your imagination, and also trying out new programming skills as you go along. It would be great to build up a repository of ideas, and music for Sonic-Pi. A central resource point would be great. The google group doesn’t really hit the spot, Is it worth a separate block on the Raspberry Pi forum? At present there are odd bits in various places. Pulling resources together in an easily accessible form, especially when Sonic-Pi 2 is launched would be great.